McInnes Wilson Lawyers has been recognised as an Employer of Choice in The Australian Business Awards 2016. “At McInnes Wilson Lawyers we endeavour to provide a working environment where people can reach their full potential at work and in their personal lives. 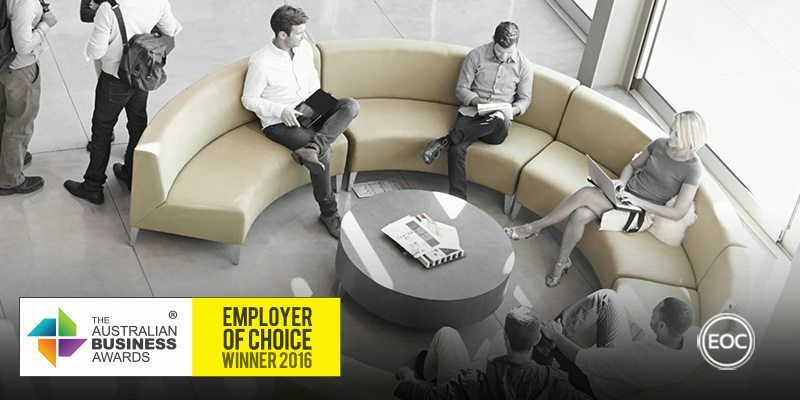 “As an Employer of Choice, McInnes Wilson Lawyers is committed to creating an organisation founded on diversity, employee engagement programs, work/life balance, maintaining a strong safety record and societal contributions (towards both the industry, our clients and the organisation on a whole). “The firm has invested in its junior solicitors, helping foster and develop their technical competence and business development capability from day one. McInnes Wilson Lawyers provides its employees with a range of professional support, including a mentor program, internal continuing legal education program and Reach Your Peak – leadership development program. “The firm’s purpose is it to provide its internal stakeholders (employees and owners) a number of programs to which a healthy, mutually supportive work life balance is fostered. Through the firm’s Health, Wealth, Life and Sustainability Program, employees have access to a range of educational information, seminars, health checks, personal training and other programs to improve and maintain their health and well-being, both physically and mentally. McInnes Wilson Lawyers is a privately owned law firm within the professional services industry, practicing in areas ranging from commercial and corporate law to personal injury and estate law. The firm emphasises a high performance culture that’s predicated on accountability, collaboration and learning for their 288 employees. McInnes Wilson Lawyers believe that challenging their employees within an innovative environment encourages healthy competition and is an integral part of achieving their key strategic objectives as a firm. This is further achieved by ensuring that leaders are approachable, responsibility is given freely and good performance is rewarded. Career pathways are built into the framework of the firm, featuring leadership and mentoring programs that are designed to foster career guidance and internal peer-to-peer learning. Coaching communication is often direct and personal, with a heavy focus on face-to-face, one-on-one meetings. This aims to encourage junior staff to speak freely without fear of being ridiculed whilst also allowing senior staff to listen closely without distraction. Overseeing this process is a competency framework, which assesses, maintains and monitors knowledge, skills and attributes for each person in the firm. Designed to measure current competency levels across the firm, the framework is used in recruitment, performance reviews, professional development and remuneration processes. This, in conjunction with annual key performance benchmarks, characterise the firm’s central performance improvement system. This system also rewards staff based on their ability to meet goals by provisioning bonuses in a points based system weighted on the achievement of benchmarks. Additionally, the firm has developed an approach to employee health and wellbeing that encompasses safety through an emergency and evacuation program, and support through bullying and mental health education programs. The firm also recognises the importance of investing in the changing lifestyle needs of its people, providing access to a range of educational information, seminars and health checks to improve and maintain employee health and well-being, both physically and mentally.